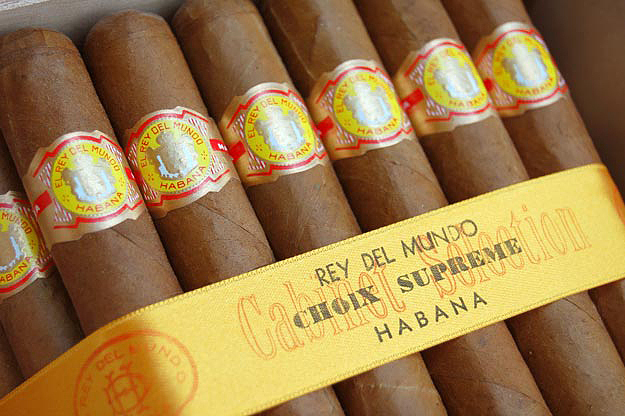 Respected, but not quite coveted may best sum up the reputation of the El Rey del Mundo Choix Supreme. I never hear anyone badmouth it, but it doesn’t show up on many wish lists, either. Perhaps this Hermoso No. 4 (5″ x 48) is unheralded because it lacks the power of the big three robustos, the Partagas D No.4, Cohiba, and Bolivar Royal Corona? Or because it lacks the novelty of more recent entries such as the Montecristo Edmundo and RyJ Short Churchill? Probably some of each. But as I become more militant about the virtue of balance over power, I find myself more enamored of the ERdM Choix Supreme. My SLB of 50 is date stamped ABR 07 and first graced my humidor last November. The first samples showed an over-the-top floral, powdery component up front. Each settled into a more agreeable profile after an inch, but these needed some time. I’ve tried one every couple of months since with better results each time. Now, after 14 months of rest, it’s time for another go. Inspection of the ribbon-bound wheel inspires confidence. The appearance is remarkably consistent. (Check out the perfectly formed head on the second from the left.) Each shows thin veining, a caramel tone and a neat cap. It is lightweight in the hand. The bunch feels even, though it’s a bit spongy to the pinch. The foot emits a whiff of barnyard. Upon lighting, it’s clear this smoke has come a long way since my first samples. I detect none of the perfumey notes that bothered me. The initial flavor is damp leather and toast. It is mild-to-medium bodied with a long, clean finish. Even in the first half inch, it exhibits hints of the honey-like sweetness for which this smoke is known. The draw is outstanding. By the one-inch mark, nuts and earth join the leather and toast. A muted floral note eventually appears, but it never gets out of line. At one-third, the Choix Supreme has found an easygoing groove. It’s tough to pick a “base flavor,” but I’d say it’s toast, verging at times on graham cracker. Honey notes remain on the finish. Even on the final third, there is no identifiable spice. I should note, however, that it was flavorful enough to stand up to a bold cup of India Monsooned Malabar. There are but two demerits: (1) the burn was a little crooked and a couple of whacks with the torch didn’t correct it; (2) it suddenly turned hot and funky with over an inch remaining– a downer to close out an otherwise excellent smoke. CONCLUSION: The ERdM Choix Supreme is a superb example of what makes a Cuban smoke special — complexity and balance. I’m forced to mark it down for the unceremonious conclusion. And because it is somewhat static, it doesn’t belong in the same league as my favorites, the Bolivar RC or RASS. But this is easily as good as the RyJ Short Churchill I smoked in March (and $3.00 less per stick, BTW). For a morning or afternoon smoke, this deserves a place on your short list. Nice Review. I enjoy these cigars a lot. With 3+ years of age on them, they go from being good smokes to being exceptional. As with many Cubans, patience is rewarded with these.